Michael Madsen. Mario Van Peebles. Ron Livingston. True Stories. Thriller. 1990s. Robberies Burglaries Heists. Police. Media/Journalism. On a mild and bright February morning in 1997, Los Angeles was gripped by the events unfolding live on their Tv screens. Two heavily armed men had attempted to rob a branch of the Bank of America in North Hollywood, but they were spotted by a passing police vehicle and the bank was quickly surrounded by over 50 members of LA finest as well as a huge crowd of onlookers and press. However, instead of surrendering the gunmen, clad in Teflar, calmly walked outside into the parking lot and let rip with a battery of AK-47's with armour-piercing rounds. 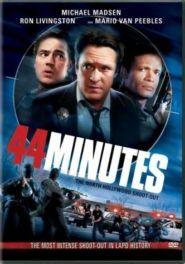 Despite being made for television, 44 minutes is still a gripping drama, competently played by the leads (although Michael Madsen's trademark inexplicable mid-sentence pauses are a bit wearing).